Welcome to Chessdom. This is your first post. Edit or delete it, then start blogging! Sao Paulo, Brazil is set to host the first half of the Grand Slam Masters Final, with Magnus Carlsen, Viswanathan Anand, Levon Aronian, Vassily Ivanchuk, Hikaru Nakamura and Francisco Vallejo Pons playing. 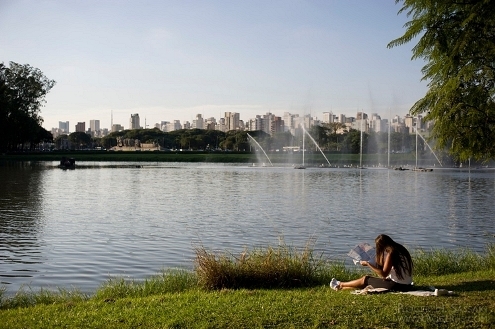 More than two hundred thousand weekly visitors of the Ibirapuera Park in São Paulo will stumble upon an unusual scene between September 25th and October 1st. Inside a giant and transparent box in the middle of the park, the top chess players will fight for the trophy of the 4th Grand Slam Final Masters. 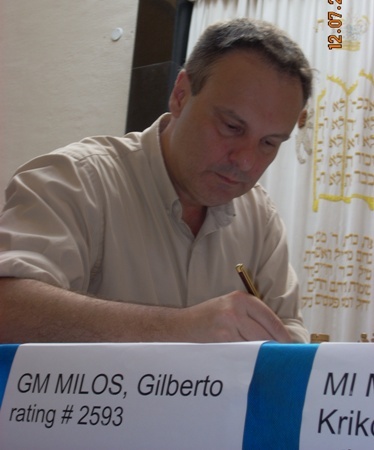 “The eyes of the chess world will be focused on Brazil during that week,” said GM Gilberto Milos, one of the organizers, in an exclusive interview with Radio Xadrez. Several other activities are planned to be performed in parallel with this great event to entertain the public and promote chess among non-practitioners, who will be amazed at the change of routine in the park. The chess programme will run from 10 am in the morning until 9 pm and a last press conference of the day. More details on this brilliant project were revealed as GM Gilberto Milos spoke to Radio Xadrez. Rádio Xadrez – How were the negotiations to bring the Grand Slam to Brazil? Gilberto Milos – The contact started when I was playing the Ibero-American Championships in Mexico in November last year [Milos was crowned champion of this tournament]. After that, the talks advanced to the next stage, we discussed a lot and started looking for sponsorship. Finally, we found strong support from the City Hall of Sao Paulo and the tournament came to Brazil. Rádio Xadrez – What is the importance of the event for Brazil? GM – We want to make a “Chess Week” in Sao Paulo. Those who can take a vacation at this time should do it and come here. You could walk through the park in the morning and then watch the games in the afternoon. In fact, the chess world will be here that week. We hope many people will come, even outside of Brazil. We want people who love chess to also visit our country. Rádio Xadrez – What are the official dates of the competition and where they play? GM – From 25 September to 1 October in São Paulo and then the second half in Bilbao (Spain). The event will be held here at the Ibirapuera Park and the players will play in a glass box, the same fashion used in Bilbao. The tournament will be fully open to the public, with an area of ​​1,500 square meters in the park. Rádio Xadrez – Is there also room for small sponsors? GM – We’re starting to attract sponsorship, so we are open to proposals. We hope to negotiate with more sponsors to improve the event. Rádio Xadrez – Will the Brazilian Grandmasters participate in some way? Mequinho for example? GM – Whenever possible, we try to invite the top players of Brazil. Of course, Mecking has his place in that group. We want to involve a large number of Brazilians, from amateurs to our best professionals, whether playing parallel tournaments, commenting on the games, doing simultaneous exhibitions, and so on. Rádio Xadrez – Are you planning to offer tour packages, hotels and transportation to the venue of the tournament? GM – Yes, that’s the idea. Soon we will give more information. Rádio Xadrez – Brazil is very hot. Will there be enough comfort in the box? GM – Of course, the box will be air-conditioned and sound-proof so that there is no noise at all. 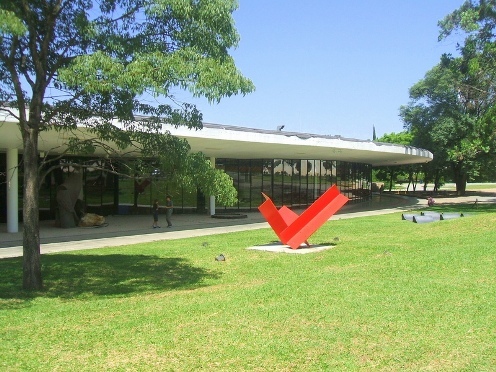 Rádio Xadrez – Why was Ibirapuera Park chosen as a site? GM – Our philosophy is to bring chess to the people. If the public does not go to chess tournaments, then tournaments will go to the public! Clearly the public does not frequent the tournaments because they are usually being played in elite hotels and theaters or other hidden locale. Our philosophy is to have chess seen by ordinary people in a park with wide circulation. The transparent box will allow full visibility to those passing through the park, even those who are not there for chess. The side events will also be outdoors, where they can be seen by all. GM – Yeah, it’s the same situation. You have to plan activities for those who know nothing about chess and also for the strongest amateur or professional players. Let’s get it to all people of all ages. GM – I hope so! If we do a good job, Brazil will definitely enter into the calendar of the world circuit and become a focal point of chess. Economically, our country is better than many European countries, we have everything to achieve it. Let’s create something positive about the event, which is really good for everyone. Rádio Xadrez – Ok, Milos! Thank you for the interview and we wish you every success in organizing this event. In the name of all chess players we congratulate you for bringing this great tournament to Brazil. GM – Now it is important to keep positive thinking and work hard. Rádio Xadrez’s collaboration is very important to spread the news in the world of chess. We count on you! Azerbaijan chess team is currently at the training camp in Gabala, preparing for the World Team Chess Championship that is starting on 15th July in Ningbo, China. Kamran Haji of apasport.az made a brief interview with GM Vugar Gashimov who is returning to the team after missing the 2010 Chess Olympiad. Gashimov first explains that he was out of the reach of the local press as he was conducting preparation in Wien, Austria, for more than a month. As is customary among the chess professionals, he refused to reveal the name(s) of his training partner(s). He added that Teimour Radjabov and Shakhriyar Mamedyarov also have large training teams at their disposal. 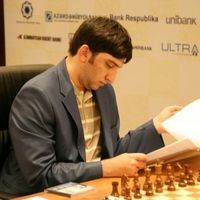 Gashimov went on to explain that last year he was expecting to play at the Olympiad and that there were no problems from his side. This time he is invited to join the team and “he put aside his personal interests” to play in Ningbo. Q: What do you mean by self-interest? A: The Biel Chess Festival in Switzerland will take place concurrently with the World Team Championship. Some time ago I signed a contract with the organizers about participating in this tournament. Now Alexei Shirov is replacing me. Q: So you canceled the contract in order to play at the World Team Championship. Did you pay a fine? A: My thanks to the President of our federation Elman Rustamov, he solved the issue. Q: According to our sources you were invited to change the flag and play for the German national team. Is this true? A: I received proposals not only from Germany, but also from several other countries. I will not name them. I didn’t accept any of them because I love my homeland. Gashimov also added that his first tournament after the World Teams will be World Cup in Khanty-Mansiysk. From 22th to 26th June an International tournament took place in Torre delle Stelle, a beautiful seaside place in Sardinia (Italy). 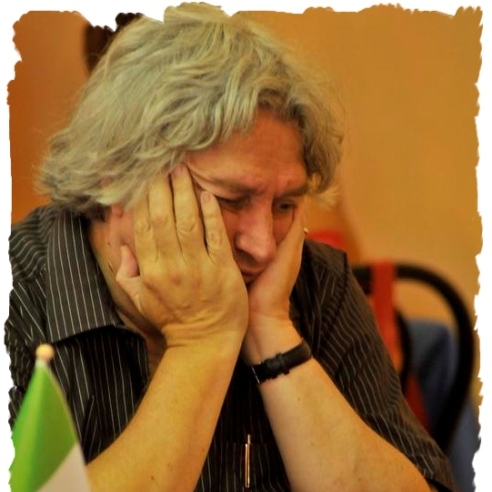 GM Jan Timman was one of the guest players and granted the following interview to Eugenio Dessy, the director of the organizer’s internet site www.cagliariscacchi.com. Photos by Danilo Mallò. Thanks also to SoloScacchi.net for kindly sending the material. Q: Mr. Timman, first of all how did you find this place, Torre delle Stelle? Have you ever been in Sardinia? A: I found everything beautiful. I came here one week in advance and the organization gave me a comfortable house just in front of the beach. This allowed me to go to the sea without failing to prepare the tournament. I have never been in Sardinia before and I enjoyed it very much. Anyway, I have been in Italy several times, and not only for tournaments. My parents loved Tuscany and when I was a boy we spent there summer holidays for many years. Q: And which tournaments did you play in Italy? A: I remember Venice 1974, for example, when GM Liberzon won. I was 23 and when the tournament finished, I stayed some days more to visit the city, together with Italian GM Sergio Mariotti and American IM James Tarjan. We had a good together and it was nice to meet Mariotti here, in Torre delle Stelle, more than 30 years later. I remember also Reggio Emilia 1984-85, a very strong tournament (Lajos Portisch was the winner) and more recently, in 2000, the European Championship in Saint Vincent, in Val D’Aosta, another beautiful Italian region. Q: What can you tell us about this tournament in Torre delle Stelle? A: I’m quite satisfied with the third-fourth placement. Even if I strongly wanted to win, you must notice that this was a strong tournament, and moreover we had to play seven games in five days, with two double rounds, and I’m 59 years old. You may say that I’m not so old, but in such conditions young players are certainly the favourites. I hope that next year there will be a 9 rounds tournament with one game per day. Q: We know this tournament was the first for you in 2011. What did you plan for the rest of the year? A: From 19th to 28th July I will play the Dutch Open in Dieren, a 9-rounds open, and from 3rd to 11th September I will play another 9-rounds in Antwerp. Then I will probably stop for the rest of the year. I usually play more tournaments but now I’m working on a book that needs some hard work. Q: Can you tell us something about? A: Yes, sure, it is a book about endgames, the title will be The Art of the Endgames. In the last years I developed a true passion for the endgames. Endgames are certainly more “scientific” than the middlegame, that’s more artistic and fascinating but is also harder (you need to spend a lot of energy in calculation) and this scientific dimension is very interesting. Think about tablebases for example: the progress of software has allowed to solve all the endgames with six pieces, so we can study these endgames knowing that we have the right solution. It is also true, however, that software doesn’t explain us the “system” to reach the solution, it simply calculates very fast and gives us a series of moves, but human mind is different and needs to synthesize. I will try to do that in the book, and I can also tell you that the Torre delle Stelle tournament will be mentioned, with some positions taken from the games played. Q: When and how did you start playing chess? A: I started when I was 8 years old. My father taught me, but he hadn’t much time to play because he worked a lot. He was a mathematician, but he loved the game. At home there were a lot of chess books, all bought by him, even if they were all written before the war, the newest were of 1938. My older brother was fanatic for chess but when I began to beat him he didn’t like it and didn’t want to play anymore against me. So I began to go to the local chess club where I could play more but I was no fanatic in those first years. When I was 12 I played in a simultaneous game held by Max Euwe and I got a draw. Q: I think that Max Euwe was (and is still) a legend in The Netherlands. Did you draw inspiration from him during those years? A: Well, Euwe was really very much important for me but mostly for his human qualities. He was very close to my family because he was my mother’s professor of maths and when he understood that I could have had a future in chess he personally cared to find some financial help for me and managed to found the “Timman’s committee”, so I could study and take chess as a profession. Q: Did someone train you in those years? A: Yes, IM Hans Bowmeester started training me when I was 15. I went to him every Wednesday, in the afternoon, because in Dutch there are lessons at school only in the morning that day. He was very important for me, he appreciated a lot the games of Botvinnik and Smyslov and always showed and explained me all details. I think he was the best master for me, he had a very good way of teaching because he was balanced, he taught well tactics, strategy, endgames and all sides of chess and I got improved much with him. Q: Which is your favourite player? A: It has always been Botvinnik, but going on I learned to appreciate many others, especially Fischer, and more recently Karpov and Kasparov of course. And also Smyslov. Q: Is there, in Dutch nowadays, a “school” or something of the sort, to form young players? A: No, there is not something really organized. Now we have only one player, Anish Giri, with possibilities to become a top ten. A: Well, but I think that first of all someone should ask me for that! In that case I would give some help with pleasure. Q: And what do you think about young Italian players? 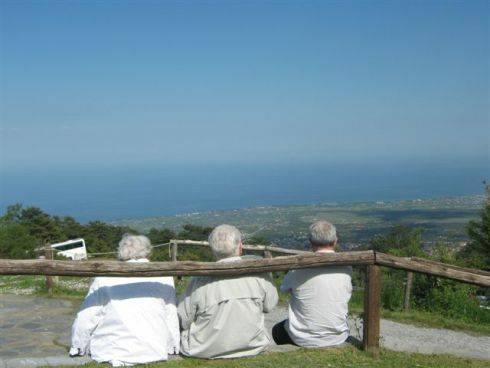 You met some of them here in Torre delle Stelle. A: I think they are good players. IM Luca Shitay will soon become a GM, I’m sure. Sabino Brunello is already GM and is always improving. They are two really strong positional players. Also Vocaturo, who wasn’t here, is strong. I think that the trend in Italy is promising with these young players. Q: And what about Caruana? A: Of course he’s the best Italian player, he’s a strong all-round player and has all the possibilities to become a top ten. Italian federation is rightly supporting him. Q: Do you think chess has changed a lot since your golden years? Which suggestions would you give to a young player intentioned to raise his/her skill? A: Sure chess has changed very much since ‘70s-‘80s. Of course computers had a lot of importance in those changes, but, in general, I don’t think that you can say that chess is now at a higher level. It is true that many opening lines have been improved and the endgames with six pieces were solved, but not always contemporary players show to play better than the past. I think that Spassky, for example, could still play now and be one of the strongest as well. Q: Do you think physical training is important in chess? A: At the highest level and in the long games and long matches it is certainly important. The most trained player of all was probably Kasparov, but he was even excessive in my opinion from that point of view: I always take long walks, also during tournaments. Long walks are good because they keep you in a good form and make you relax. Q: Have you got a game of yours that you love particularly? An “immortal game”? A: I love several of my attacking games, but my best game I think was the Karpov-Timman played in Mar del Plata 1982, when I played an excellent positional game. Q: In conclusion, can you tell us something about your hobbies and/or interests? A: I like music, of different kind, but mostly I love reading. I like the classics of Russian literature, above all Dostoyevsky and Tolstoy. I also love South-American literature, especially Borges, and I also wrote an essay about him. Other favourite writers are Kafka and, among Italian writers, Italo Svevo: he didn’t write many books but those few books were really excellent, like Confessions of Zeno. 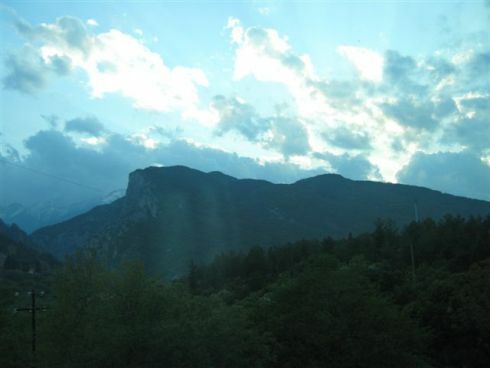 Q: Thank you Mr. Timman for your kindness and we are waiting for you at the next Torre delle Stelle. A: If you invite me again, I will certainly come. The 2011 Ukraine Chess Championship is set to start on 10th June. Average rating of the participants in the Championship is very high, 2,650 points, which corresponds to the 17th FIDE category. For the first time in the history of national events, all strongest chess players of the country will take part, except for Vassily Ivanchuk who earlier committed to Bazna Kings 2011. Ruslan Ponomariov, Pavel Eljanov, Alexander Moiseenko, Zahar Efimenko and Andrei Volokitin will play. On this occasion Sergey Melnik from Kommersant.ua interviewed the President of the Ukrainian Chess Federation (FSHU) Viktor Kapustin. Q: You probably needed a large increase in the prize money in order to attract such a strong filed. A: We have allocated 600,000 UAH (about 51,000 EUR ed.note), which will be distributed to all participants. In earlier years the prize fund was almost symbolic, about 60,000 UAH. For that reason our top players didn’t bother to compete. Q: Ukraine is traditionally performing superbly at the Chess Olympiads and in team competitions. Why, then, our players are not among the real contenders for the world crown? A: Only top six ranked players could participate in the qualifying tournament. Unfortunately, Ukrainians were not there. But the things could change next year, Ivanchuk is now confidently holding a place in the top, while Ponomariov, former world champion, has plenty of possibilities to improve from the current 11th place. Q: Until recently, Sergey Karjakin was considered to be the most promising Ukrainian young player, but now he moved to Russia. Do we have other young talented chess players who are able to replace him? A: Except for Ivanchuk, who is already over 40, other members of our national team are in the age of 24-28 years. This is a fairly young squad, and can afford to play on a high level for many years. Ivanchuk too, with more than 20 years of experience in professional career, can successfully perform in the future. Of the younger players who are still on their way to the national team I would mention Illya Nyzhnyk. The 14-years old is currently the youngest Grandmaster of the world and an extremely promising player, who already has experience from the international tournaments. But Nyzhnyk needs more practice to improve his game. The Federation is preparing to take a number of steps to help this young player. He needs a coach. This requires some expenses. The European Seniors Team Championship was held on 3-11th May in Olympus region, Greece. This was a good opportunity to arrange an interview with Mr. Almog Burstein, ECU Board Member and Chief Arbiter of the Championship. Q: Mr.Burstein, you are the chief arbiter of the European Seniors Team Championship. What are your impressions about this event? A: It is very pleasant to be the chief arbiter in a tournament of seniors, because most of them came here to enjoy the atmosphere and the resort, and they don’t complain much… It is much easier to be an arbiter in such a tournament, in comparison with the “professional” championships. Q: So you didn’t have a very challenging job to do? A: There were some legitimate requests, to make some small improvements in the tournament, but overall the work was not very demanding. Q: You are also in charge of the Seniors’ chess within the European Chess Union. What are your duties in this domain? A: Yes, I was nominated by the former President Boris Kutin six months before the elections. My duties are to promote seniors’ chess in Europe, to help in providing sponsors for the seniors’ events and to improve the conditions for chess for veterans. Honestly, for now we didn’t achieve that much, but I am preparing a program in this direction and I hope to see the implementation soon. Q: You are also the Treasurer and Board Member of the ECU. What are the first results of the new administration? How do you see, from an insider point of view, the work and the atmosphere within the new Board? A: For the first few months after the elections we were busy with transferring the ECU office from Berlin to Belgrade and the bank account from Berlin to Switzerland. Now we are actively working on the programs for the development of chess in Europe. Sava and Vladimir are doing a great job in the office in Belgrade. The flow of information from the office to all federations is improving all the time. We managed to finish the bidding procedures for our three important tournaments – the European Team Championship in Warsaw in 2013, the European Youth Championships in Prague and the European Club Cup in Eilat, Israel, in 2012. Q: Is this the first major ECU event in Israel? A: Last time that we organized a big European event was the European Team Championship back in 1989. A: Yes, Haifa. But since then – we organized some FIDE events like the World Team Championship in 2005, the first World Blitz Championship in 2006 etc. Q: Do you think that now, after the ECC in Eilat, there will be greater activity in Israel in regard to the ECU events? A: Certainly. We are also interested in organizing the European Youth Championships in the future, and possibly one of the senior and amateur championships. We are definitely hoping to strengthen the relations between the Israeli Chess Federation and the ECU. Q: As a Treasurer of the ECU, can you tell us what is the financial status of the Union? Have you noted anything extraordinary, is there a plus or minus…? A: The financial situation is quite good. For this I must compliment and thank the former Treasurer, Mr. Kurt Gretener from Switzerland. He did a fantastic job supervising the financial flow and saving a lot of money for the ECU. This is why I agreed to move the bank account to Switzerland, to be under Mr.Gretener’s day-to-day supervision, and not to Israel where I am residing. I didn’t even have to travel to Switzerland, everything can be done through the Internet and it saves a lot of expenses. Q: We have heard from Mr.Yazici on several occasions that organizers of some of the earlier ECU events actually owe money to the Union. Can you clarify this situation? A: We have some issues with few Federations that have collected ECU fees but didn’t transfer them on time. 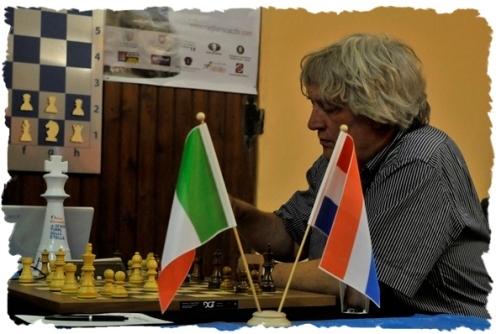 The most serious problem is with the organizers from Fermo in Italy, who hosted the European Youth Championship. The organizer was not the Italian Chess Federation but a private one. Anyhow, we are going to sue him, in a joint effort with the Italian Chess Federation. Our lawyer already sent the first letters and we will continue this legal battle until the positive conclusion. All the other issues are minor compared to Fermo, and usually after some time we manage to settle everything with the Federations concerned. Q: What will be the future activities of the ECU Board? A: We will have a Board meeting in July in Iasi, Romania, during the European Youth Team Championship. We are working on many new projects such as an insurance policy for seniors and all professional players. We will discuss all these in July and then bring before the GA in Creta Maris. 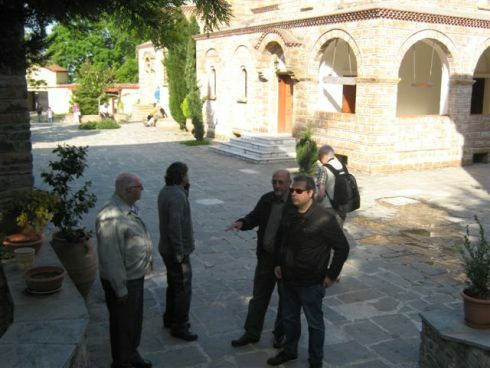 The excursion to the mount Olympus on 8th May was a good opportunity to perform an interview with Mr. Theodoros Tsorbatzoglou, head of the Organizing Committee and ECU Board Member. Q: Mr. Tsorbatzoglou, what are your impressions from the European Seniors Teams Championship? A: It is a very nice event, ongoing in a friendly and sporty atmosphere. We are really impressed with the seniors’ chess and this is one of the best tournaments we have ever organized. Our guests from 20 countries are very satisfied, they enjoy the place, the nature and the games. We combined the event with two historical tours in Thessaloniki and Olympus and this was something exceptional for the participants. Another innovation is that we have converted the hotel’s main lobby bar into a chess café, placing 20 boards in the area. In this way, the participants can play chess whole day, analyze and have fun with their colleagues. Q: What are the news from the European Chess Union? A: ECU has to move and act in the general crisis environment that affects Europe. The crisis in Europe is not only a financial crisis, it is also a political and social crisis. 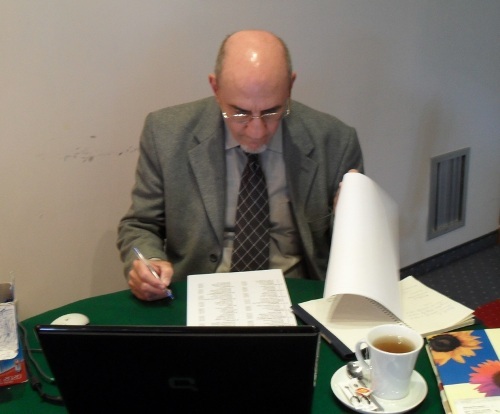 Silvio Danailov and his team is a new administration that needs time to apply the program and give a new profile to the European Chess Federation. Q: And what are your thoughts and actions as a Board member? A: I was elected for the Board as an individual candidate. My role is to propose, ask, vote on proposals and contribute to the organization management when I am asked for. The two Board meetings that we had until now were constructive and compositive. My personal wish now is to travel to all European countries and speak with the chess family, write down the existing situation and make a study about European chess and how we can connect all pieces into a creative sports’ plan. I have already visited some countries and I scheduled more visits, which I might also combine with participation in the tournaments. Q: What are the news from the FIDE Committees? A: After the changes applied in the structure of FIDE Committees, the operation became much better and efficient. Trainers’ Committee and Arbiters’ Committee are excellent examples for a long time already. In the recent period we see a real booming of action in the FIDE School Committee. Now, in an area where I am also involved, FIDE Events’ Committee, we have progressive proposals in order to justify the events, the bidding procedures and regulations with the modern needs and sports’ guidelines. As I have already said, we are now acting in a difficult political and financial environment, the resources are limited, so we need to work and bring the results. We don’t need theories, we can’t waste time. Q: What is the next event in Thessaloniki? A: The only certain event is the traditional Open “Alexander the Great”, held annually, but as we now have a new elected Mayor and a new administration in Thessaloniki, there will be a new tourist strategical plan for the promotion of the City for the coming years. Our vision is to see some of the biggest world chess events in this city in the future. Q: The victory was very close. How much were you influenced by the incident with the clock? A: I try to remain calm. Indeed, I was 5-10 seconds away from the next round, but now what to think about this? In the first blitz game I was successful, it really lifted my spirit, the second game was also developing in my favor. Well, you know what happened next. Q: This worked in favour of the opponent? A: With all due respect to Kramnik, this incident was more in his favor than in mine. One can argue on this subject. I think I had done everything that depended on me, I cannot say that I played badly, moreover I felt the victory is close, just no luck. After the incident I immediately remembered the footage of basketball finals at the Seoul Olympics, when USSR beat USA with a direct hit in the last second. In sport, anything can happen. Q: You have been preparing for the Candidates for the last six months. Do you now feel that the time is wasted? A: I have no regrets. What could I do? Today, a broken clock, tomorrow a chandelier will drop. Q: Speaking of the supporting team, who were your assistants? A: I would prefer not to disclose this and have it remain a mystery. I can only mention GM Igor Nataf with whom I worked for a long time. Q: What is expected from semi-finals? A: Now we have a somewhat unusual situation. For example, Kramnik might have expected to meet Aronian, but now he will face his compatriot Grischuk. Gelfand was probably thinking of Topalov, but he will now play against Kamsky. Their teams will probably have to make special preparation. Veselin Topalov and his manager Silvio Danailov gave an extensive interview for the National TV before the Candidates Matches 2011. The interview was taken in the city of Sandanski (in south Bulgaria) where Topalov conducted his final preparation for the matches. Veselin Topalov shared that he expects the Candidates Matches to be a very difficult and long tournament. He is concentrating only on the first match for now, as his last match against Kamsky in Sofia was very balanced, while Topalov clearly states that “Kamsky is much better now than a few years ago”. 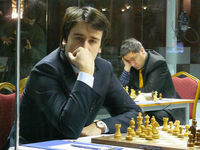 Topalov did not reveal all his seconds, but confirmed the usual suspects Cheparinov and L’Ami are in the team. 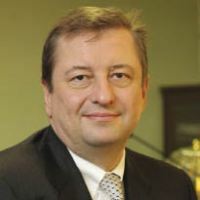 Arkady Dvorkovich, Assistant to the President of the Russian Federation, Chairman of the Supervisory Board of the Russian Chess Federation, revealed some details about the Candidates Matches, which will be held from 3 to 27 May 2011 in Kazan, Russia. Q: Why did you propose Kazan as venue for the Candidates Matches? A: When FIDE understood that having Armenian chess player competing on the Azerbaijan soil became impossible, we decided to act as peacemakers. We stated that we are open for proposals from all countries, but if nobody should stand up, we are prepared to resolve the situation. Tatarstan is capable of hosting such event and we know that they won’t have organizational problems, that everything will function perfectly. And we will share the financial costs. Q: According to the FIDE regulations, the host of the Candidates Matches is entitled to nominate one player. GM Mamedyarov, a nominee of Azerbaijan, will compete in Kazan. Why did Russian Chess Federation agree to this? A: It was part of the compromise. Q: Compromise at our expense? A: Yes, for the peace efforts of Russia. Sometimes it is necessary to reaffirm our position of the leaders in the chess world and that we have influence in the decision-making. Yes, there is the cost, but more important is what we do for our country’s reputation. A: Of course, we would have liked to include another of our players, but we also want to have all the world’s strongest players competing, and without the Armenian Grandmaster, the chess world would be at huge loss. A: We lost the crowns of World Champions, it is sad, of course. But if you look at the rating list of top 100 players, Russia is still dominating. However, the competition is constantly growing stronger, that is true.